Whether you’re an experienced hiker or you’re just looking to get your feet wet, you’ll need a good pair of shoes to support you on your trek. Ideal for all sorts of aquatic activities, water shoes offer great protection, traction, comfort, and safety. To help you find the perfect pair, we’ve selected the 10 best men’s water shoes for sale. Not sure where to start? Check out this list of important specs! Size range: You’ll want to make sure that your new water shoes fit just right, and the available range of sizes varies from brand to brand. All sizes listed are in standard U.S. men’s measurements. Available colors: Even in the great outdoors, you’ll want shoes that match your style. If you’re a fashion-conscious hiker, you’ll want to look for a brand that offers options. Some selections come in over a dozen color choices, while others offer a handful. Slip resistant: Any hiker needs to stay safe. A good pair of water shoes helps you avoid slips and falls. Most water shoes come with textured rubber soles to keep your feet on the ground. If you need extra grip, get slip resistant shoes. Quick dry: Ordinary shoes can quickly become waterlogged and can take ages to dry. Water shoes, however, are meant to get wet. Some feature special materials that dry very quickly so you can get back outdoors as soon as possible. Sole material: Before you buy your new water shoes, you’ll want to know what its sole is made of. They’re designed to prevent punctures, so it’s important to look at the details here. Different soles can feel differently, so pick the softness you prefer when buying. Shoe Material: Polyester, fabric, textile – the choices on our list of the top best shoes for walking in water embody a range of materials. The material strongly impacts the look and feel of the shoe, so keep this one in mind. Now that you know what to look for let’s take a look at our top ten best products from our research. Although the shoes on this list represent plenty of styles and work best in different scenarios, they all offer enhanced support for your watery adventures. Water shoes provide clear and substantial benefits, as they can transform an unpleasant hike through muddy terrain into a blast. Let’s get started! The Merrel Blaze Aero Sport makes an excellent choice for anyone looking for the best water and hiking shoes. The shoe has a clearly rugged appearance and incorporates a breathable and light textile material. Meant for speed hiking, the shoe’s insole includes soft foam and shock pads to reduce impact with each step, letting you run faster and farther. One of the best hiking shoes for men, this shoe has been compared to traditional hiking and running shoes in its appearance and feel. However, it still offers the characteristics of being lightweight, breathable, and durable. Though it only comes in three colors, each of the shoe’s palettes lends a distinguished, masculine, and adult appearance. Unlike other water shoes on this list, the Merrel Blaze Aero Sport could be mistaken for a traditional running shoe, and wouldn’t look out of place as part of your everyday outfit. What’s more: its textured, synthetic sole provides stability and comfort over uneven ground, and the shoe’s design eliminates odor and sweat. If you’re on a budget, the Aleader Quick Drying Shoe offers a great value at an affordable price. Breathable and lightweight, this shoe makes a great choice for anyone looking for the best water shoes for the beach. The Aleader Quick Drying Shoe’s hydrophobic mesh ensures that water can freely drain from the shoe, preventing waterlogging and allowing the shoe to dry quickly after aquatic activities. The shoe comes in a wide variety of colors and designs and has an overall simplistic, no-frills appearance. 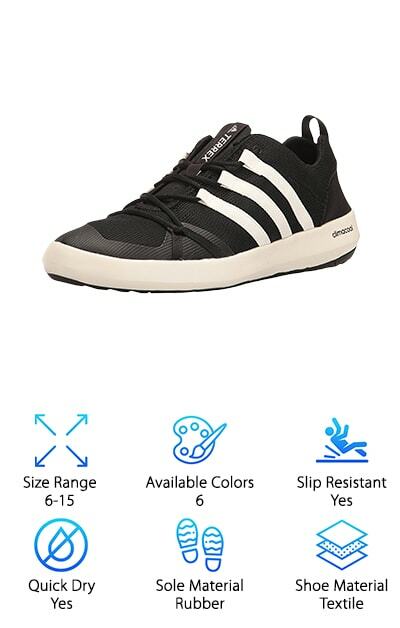 Unlike many of the other shoes on this list, the slim and light design of the sole of the Aleader Quick Drying Shoe makes it preferable for traveling shorter distances, or for anyone who just needs the added protection of a rubber sole and doesn’t worry about supporting their feet. We recommend this shoe to anyone interested in a great deal on a shoe for short hikes in wet conditions. Suitable for men, women, and children, the Sikelo Water Shoe provides another affordable option for the budget-conscious water sports enthusiast. These shoes include a thin rubber sole that simulates the experience of walking barefoot. The shoe is strong enough to help protect your feet from rocks and soft enough to provide a comfortable experience. 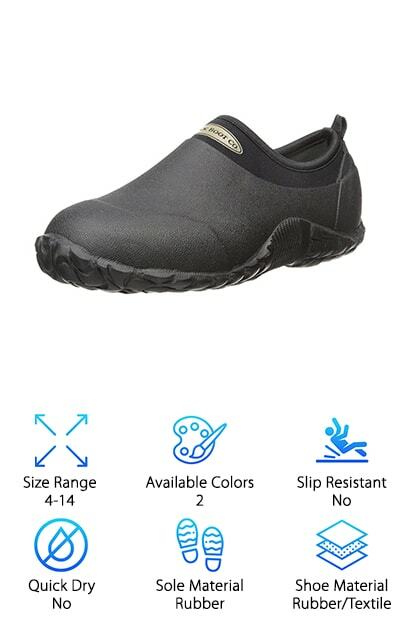 Additionally, the Sikelo Water Shoe’s soles contain seven holes to ensure the quick and effective drainage of water, both during and after use. Like many of the other options on this list, these shoes come in several different colors and designs, including a camouflage pattern and multi-colored leaf designs. These shoes can be rinsed off after each use, even after being used in the dirt and mud, and are ready to go the next day. Because these soft, lightweight shoes give little support for a more natural feel, we list them among the best rated water shoes. Looking for one of the best water shoes for hiking? Look no more! For nature-lovers intrigued by a spin on the traditional water shoe, the KEEN Men’s Arroyo II Sandal fits the bill. This sandal offers the best of both worlds: its outsole is meant to handle varied terrain with ease, while the open waterproof leather upper gives maximum breathability. 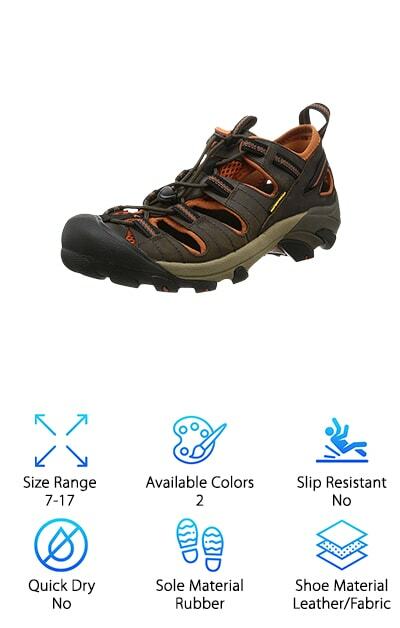 The sandal’s thick rubber sole gives more support than ordinary sandals, and its patented rubber toe cap protects the toes from sharp rocks and sticks, making these sandals the among the best water shoes for rocky beaches and the best shoes for river hiking. Because of the open, sandal-like design of the outsole of these shoes, they compete with the best river shoes, as long as you don’t mind submerging your feet! During the hot, humid summer months, these sandals make an excellent choice for hikers and backpackers looking to minimize weight and maximize their comfort. 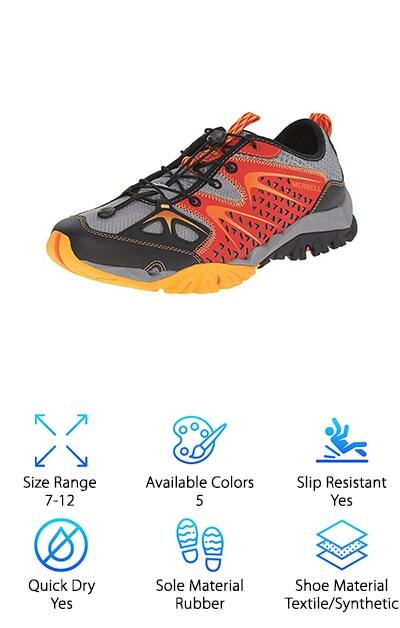 Like Merrell’s other shoe on this list, the Blaze Aero Sport, the Capra Water Shoe features a stylish, rugged, and masculine design, making it one of the best water shoes for men. This shoe includes a cord-and-lock lacing system, which helps to keep it tight on the foot, ranking it among the best water shoes for kayaking. The shoe comes in five colors, ranging from muted designs that blend into muddy terrain to bright patterns that help you stand out. The shoe features a foam and mesh lining for cushioning, allowing for greater comfort, and includes a removable insole to give you greater control over drainage and moisture. Among the best-rated water shoes, the Merrell Capra Water Shoe makes a great choice for anyone looking for a quality product from a trusted brand. Suitable for women as well as men, the Jeater Hiking Shoe provides a more affordable alternative to some of the other options on this list. Though it doesn’t have some of the features of fancier shoes, the Jeater Hiking Shoe certainly covers the basics for anyone looking for the best water hiking shoes on a budget. The shoe comes in many colorful designs, and its transparent, synthetic mesh material creates great breathability and ensures rapid drainage during use. Although the shoe doesn’t offer much support, the insole incorporates pressure-absorbing materials to increase comfort, and its outsole’s zig-zag pattern helps you grip onto wet surfaces. These shoes come in a wide range of sizes and colors, making them great for kids, too. The Jeater Hiking Shoe’s durable material and construction demonstrate that it is built to last, and anyone looking for water shoes good for hiking should be pleased with this choice. Another affordable option is found in the Aleader Mesh Water Shoes. These shoes are easy to slip on and feature a transparent fabric mesh design. Unlike many of the other selections on this list, these shoes do not use laces and instead fit snugly over the foot for convenience and speed. Lightweight and durable, the shoe’s perforated rubber sole and mesh construction enable a quick drying time and prevent the shoe from getting waterlogged. 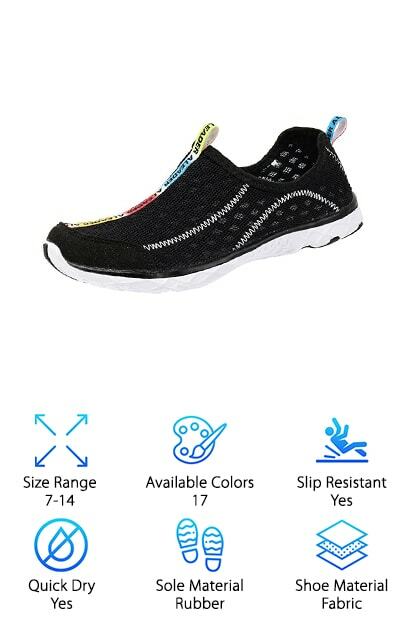 Though the bottom of the shoe does little to support the foot during long hikes or runs, the lightweight design is great for aquatic activities that don’t require going long distances. The shoe’s sole also features rubber pods placed strategically in places where water most rapidly accumulates for increased traction. Some of the best water shoes for swimming, these shoes make a great companion for a trip to the pool or the beach. Be the envy of your friends with the stylish and fashionable Adidas Outdoor Terrex Climacool water shoes! Featuring the signature Adidas look, all six colors of this shoe have a thick, aesthetically pleasing sole and three stripes along the side. Though suitable as water shoes, the Climacool shoes look appropriate and fitting as part of your everyday wardrobe, making them the best shoes for boat fishing on our list. The shoe’s outsole features a hexagonal design to assist with grip and traction, and include several holes to allow water to drain during use and to provide quick drying. Additionally, the shoes come with a stretchable heel insert to allow for an optimal fit. 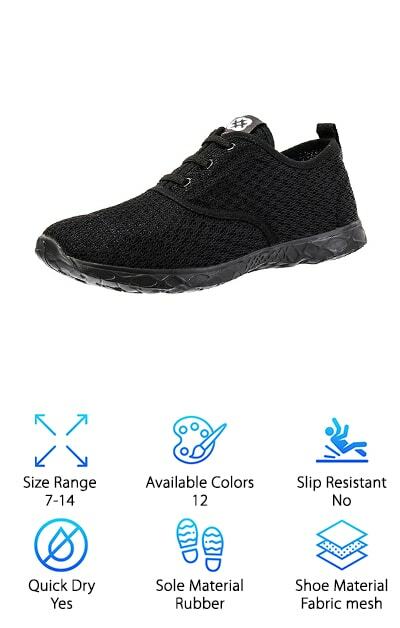 Though the design of the sole makes this shoe less than ideal for running, anyone looking for the best shoes for fishing on a boat should give these a shot. The affordable NeedBo Quick Drying Aqua Shoe’s plain, straightforward design does not call attention to itself but instead emphasizes functionality over style, which is why we consider it one of the best water shoes for hiking. Its thin material gives the shoe a flexible, lightweight form, and the shoe’s perforated fabric body makes its quick draining and drying qualities apparent. For light hiking, walking on the beach, or sailing, these shoes provide an excellent and simple choice. 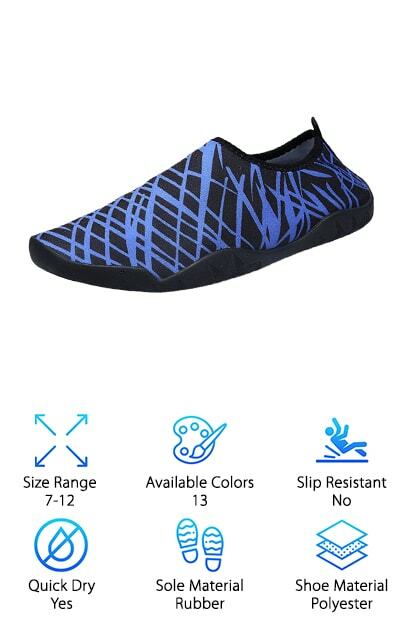 The shoe’s low price and flexible, compressible design makes it a great selection for vacationers who need the best shoes for fishing and other activities. You can easily throw these shoes in with the rest of your luggage, and if you lose them, replacing them won’t break the bank. If you’re just looking to go on a short trip, or plan on using your water shoes only a few times, you can’t go wrong with the affordable NeedBo Quick Drying Aqua Shoe. If you’re more interested in a completely waterproof shoe, instead of one designed to allow water to flow freely through the sole, take a look at the MuckBoots Camp Shoe. Heavier and more rigid than other items on this list, this shoe is ideal for anyone looking to protect their feet from the elements at the cost of having to sacrifice comfort and breathability. One of the best walking shoes for men, they are meant for serious campers looking to protect themselves from the elements and can be worn in temperatures ranging from sub-freezing to 85 degrees Fahrenheit. 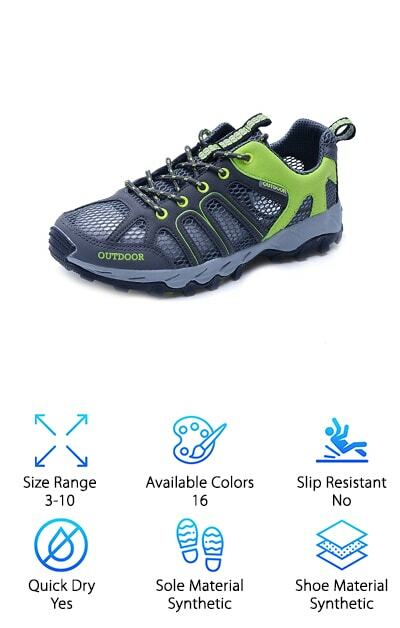 However, in addition to being one of the best shoes for backpacking, they also suit casual wearers who prefer protection and comfort during outdoor activities like gardening or getting the mail. These shoes keep your feet dry and clean in the dirt and mud, though they can get waterlogged if submerged completely. As such, they are not meant for sport, but rather for protection from the elements.